Are you a breakfast lover? What’s better than a big, fluffy omelet filled with your favorite vegetables, meat, and cheese, and cooked to perfection? No matter what type you like, Western, Spanish, Denver, or any other variety, you’ll find something that pleases your palate at the 10 best omelet places in West Virginia! With locations in Beckley and Parkersburg, West Virginia, the Omelet Shoppe has been satisfying your omelet cravings for over 40 years. Their full breakfast menu is available any time with such savory omelets as the Country Boy filled with sausage, hash browns, onions and cheese and topped with homemade sausage gravy, or Ollie’s Supreme, made of ham, sausage, onions, peppers, and cheese and topped with chili or red sauce. 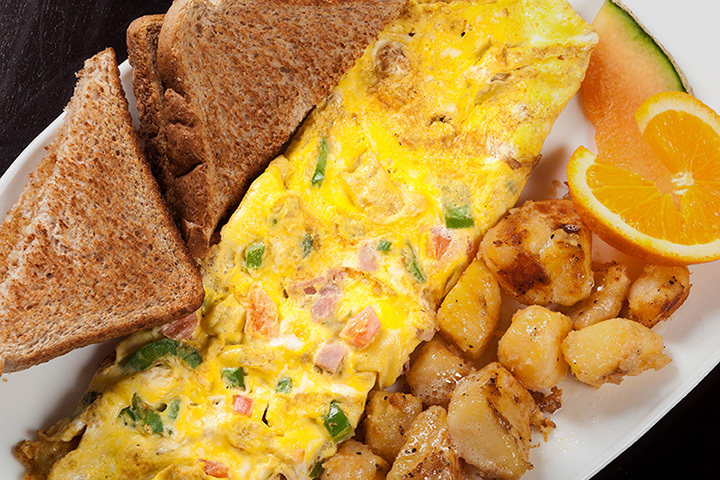 And the only thing that makes this place better is knowing that Tuesdays are half-price omelet days! First Watch in Charleston, West Virginia, is a great place for breakfast or a leisurely weekend brunch. Either way, you’ll find a menu that has a large selection of delicious food including some of the best omelets around. You’ll have a hard time choosing between the Bacado, made with bacon, avocado, and Jack cheese topped with sour cream and salsa, the Chile Chorizo, made with Chorizo, avocado, green chilies, onions, two chesses, and topped with sour cream and pico de gallo, or The Works, made of, well, everything! You won’t leave hungry! If you want a cozy little place that has the best coffee in town, great bagels, omelets, and pastry, then you want to visit The Grind in Morgantown, West Virginia. This is breakfast at its finest and you’ll be impressed by the fast and friendly service. They also have free Wi-Fi and plenty of parking. High ratings and great reviews on social media have named this little breakfast place a hit. Butter It Up in Huntington, West Virginia, serves amazing coffee, omelets, and other breakfast sandwiches to start your day right any time of the day. And if you like a more traditional breakfast, like sausage and eggs, they have that, too. This is a brand new place that’s fast becoming a hot spot in the area and for those traveling through. The Skiff in Ravenswood, West Virginia, makes everything from scratch using local ingredients. Their omelets can be combined with a variety of vegetables, meat, and cheese, and are sure to satisfy your craving. The friendly staff adds to the dining experience. For omelets the size of your head, you definitely want to visit Mary B’s Diner in Parkersburg, West Virginia. This little diner represents the Mountain State’s hospitality and home cooking very well with food that is always tasty and prepared to order by a hard-working staff. You’ll feel like you’re stepping back in time when you visit Stella’s in Lewisburg, West Virginia. This little out-of-the-way diner is a great example of a unique place that offers fast, friendly service and great food. With a diverse menu that can satisfy your breakfast hunger, you won’t find anything typical here. Using the best local ingredients, original dishes are served with a creative flare. If you don’t live nearby, the drive for their Sunday Brunch is worth the trip. Located inside The Greenbrier Resort in White Sulphur Springs, West Virginia, Draper’s is a trendy little café that offers good food at reasonable prices. If you like large, fluffy omelets, then you’ll want to tempt your taste buds from the build your own station at the buffet or chose something a la carte from the menu. This little hidden gem of country cuisine should not be missed. Located in Frametown, West Virginia, Granny’s Kitchen is just what you’d expect at your own granny’s house. Granny’s serves breakfast, lunch, and dinner, and provides great food for the price. Clean and welcoming, this is worth the drive. Omelets, biscuits and gravy, sausage and potatoes, or whatever your pleasure is for breakfast, you’ll find it here at The Lunch Box in Elkins, West Virginia. With daily specials and a unique lunchbox-themed atmosphere, this place serves food and fun. Open every day except Sundays.